Visualization of the magnetic field on a stereo cassette containing a 1 kHz audio tone. 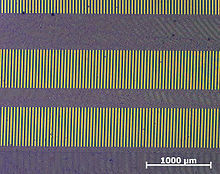 Individual high-frequency magnetic domains are visible. Tape bias is the term for two techniques, AC bias and DC bias, that improve the fidelity of analogue tape recorders. DC bias is the addition of a direct current to the audio signal that is being recorded. AC bias is the addition of an inaudible high-frequency signal (generally from 40 to 150 kHz) to the audio signal. Most contemporary tape recorders use AC bias. When recording, magnetic tape has a nonlinear response as determined by its coercivity. Without bias, this response results in poor performance especially at low signal levels. A recording signal which generates a magnetic field strength less than tape's coercivity is unable to magnetise the tape and produces little playback signal. Bias increases the signal quality of most audio recordings significantly by pushing the signal into more linear zones of the tape's magnetic transfer function. Magnetic recording was proposed as early as 1878 by Oberlin Smith, who on 4 October 1878 filed, with the U.S. patent office, a caveat regarding the magnetic recording of sound and who published his ideas on the subject in the 8 September 1888 issue of The Electrical World as "Some possible forms of phonograph". By 1898 Valdemar Poulsen had demonstrated a magnetic recorder and proposed magnetic tape. Fritz Pfleumer was granted a German patent for a non-magnetic "Sound recording carrier" with a magnetic coating, on 1928-01-31, but it was later overturned in favor of an earlier US patent by Joseph A. O'Neill. The earliest magnetic recording systems simply applied the unadulterated (baseband) input signal to a recording head, resulting in recordings with poor low-frequency response and high distortion. Within short order, the addition of a suitable direct current to the signal, a DC bias, was found to reduce distortion by operating the tape substantially within its linear-response region. The principal disadvantage of DC bias was that it left the tape with a net magnetization, which generated significant noise on replay because of the grain of the tape particles. Some early DC-bias systems used a permanent magnet that was placed near the record head. It had to be swung out of the way for replay. DC bias was replaced by AC bias but was later re-adopted by some very low-cost cassette recorders. Although the improvements with DC bias were significant, an even better recording is possible if an AC (alternating current) bias is used instead. While several people around the world rediscovered AC bias, it was the German developments that were widely used in practice and served as the model for future work. The original patent for AC bias was filed by Wendell L. Carlson and Glenn L. Carpenter in 1921, eventually resulting in a patent in 1927. The value of AC bias was somewhat masked by the primitive state of other aspects of magnetic recording, however, and Carlson and Carpenter's achievement was largely ignored. The first rediscovery seems to have been by Dean Wooldrige at Bell Telephone Laboratories, around 1937, but the BTL lawyers found the original patent, and simply kept silent about their rediscovery of AC bias. Teiji Igarashi, Makoto Ishikawa, and Kenzo Nagai of Japan published a paper on AC biasing in 1938 and received a Japanese patent in 1940. Marvin Camras (USA) also rediscovered high-frequency (AC) bias independently in 1941 and received a patent in 1944. The reduction in distortion and noise provided by AC bias was rediscovered in 1940 by Walter Weber while working at the Reichs-Rundfunk-Gesellschaft (RRG). The German pair received several related patents, including ‹See Tfd›DE 743411 for "high-frequency treatment of the sound carrier". Possibly independently of Weber and Braunmühl, the UK company Boosey & Hawkes produced a steel-wire recorder under government contract during the Second World War that was equipped with AC bias. Examples still surface from time to time, many having been disposed of as government surplus stock. After the war, Boosey and Hawkes also produced a "Reporter" tape recorder in the early 1950s using magnetic tape, rather than wire, which was based on German wartime technology. As the tape leaves the trailing edge of the gap in the tape head, the oscillating magnetic field due to the applied AC bias is rapidly reduced to the average magnetic field of the much slower-changing audio signal, and the tape particles are therefore left in this magnetic condition. The non-linearity of the magnetic particles in the tape coating is overcome by having the AC bias field greater by at least an order of magnitude (10× the maximal audio field), which saturates these particles in both magnetic directions while they pass the gap in the recording head. The AC bias level is quite critical and, after being adjusted for a particular tape formulation with a specific recording machine, is usually left unchanged. The mechanism is similar to the demagnetizing signal which is used to erase the tape except that the desired audio signal is retained on the tape during the recording process. The large AC bias acts as a demagnetizing signal which decays exponentially as the tape moves beyond the head, while the audio signal is the residual field that remains imprinted on the magnetic medium. A quantitative explanation of AC bias has been given by Bertram. The characteristics of the recording system change quite markedly as the level of the bias current is changed. There is a level at which the system gives the minimal distortion (which is the highest bias). There is also a level at which the high-frequency response is at maximum (lowest bias). These conditions unfortunately do not occur at the same bias level. Professional reel-to-reel and cassette recorders are always set up for minimal distortion. Consumer equipment, and in particular compact-cassette recorders have the bias set at a compromise level (usually a little higher) to give good frequency response and acceptably low distortion. Bang & Olufsen invented and patented the so-called Dolby HX PRO (Headroom eXtension) principle for combining bias control with the Dolby system for better high-frequency response in cassette recorders. Tandberg invented the cross-field recording system for tape recorders where a separate head with the bias was used. Adding bias to the recorded signal in the one head had tended to limit the system's high-frequency response, due to interaction between bias and signal. The cross-field system produced less interference from the bias signal. This allowed extended high-frequency performance compared to mixing the two signals in the recording head, but mechanical tolerances for cross-field are tight. The system required frequent readjustment and was largely abandoned. Japanese manufacturer Akai, however, persisted with cross-field bias and successfully marketed portable and mains-operated machines featuring the cross-field system. Different amplitudes of bias field are optimal for different types of tape, so most recorders offer a bias setting switch on the control panel, or, in the case of the compact audio cassette, may switch automatically according to cutouts on the cassette shell. Ferric-based tapes require the lowest bias field, while chrome-based tapes (including the pseudo-chromes) requiring a higher level, and metal-particle tapes requires even more. Metal-evaporated tape accepts the highest level of bias, but it is mostly used for digital recording (which does not use bias, as the non-linearity is not a major problem). The same is valid for a combination cassette tape, the FeCr variant, on which a thicker ferric layer was covered by a thinner chrome layer. The idea behind this was that at lower frequencies and higher head currents the ferric layer would be more deeply magnetized, while at higher frequencies only the top Cr layer was active. In practice, this didn't work well, and some claimed[who?] that this thin chrome layer was quickly polished off in heavy use. ^ Poulsen, Valdemar, "Method of and apparatus for effecting the storing up of speech or signals by magnetically influencing magnetisable bodies", BP 8961, 1898, page 3, row 34. ^ O'Neill, Joseph A., "Record for reproducing sound tones and action," U.S. Patent no. 1,653,467 (filed: 22 March 1926 ; issued: 20 December 1927). ^ Carlson, Wendell L. and Carpenter, Glenn W., "Radio telegraph system" ‹See Tfd›US 1640881 (filed: 26 March 1921 ; issued: 30 April 1927). ^ McKnight, Jay. "AC Bias at Bell Telephone Laboratories, 1936...1939" (PDF). ^ Camras, Marvin, "Method and means of magnetic recording" ‹See Tfd›US 2351004 (filed: 22 December 1941; issued: 13 June 1944). ^ Engel, Friedrich Karl (August 2006). "Walter Weber's Technical Innovation at the Reichs-Rundfunk-Gesellschaft" (PDF). Retrieved 18 June 2010. Klingelnberg, Arndt (March 1, 1990). "Some Not Well Known Aspects of Analog Tape". AES E-Library. Audio Engineering Society. O'Kelly, Terence. "Bias" (PDF). The Inventor's Notebook. BASF (3). Retrieved 2015-04-08. Jay McKnight; Jeffrey McKnight (2012). "Some Popular Misconceptions About Magnetic Recording History and Theory" (PDF). Audio Engineering Society. Retrieved 2017-08-09.